CODRAL® provides a wide range of tablets, capsules, hot drinks & liquids for fast & effective relief from cold & flu symptoms. 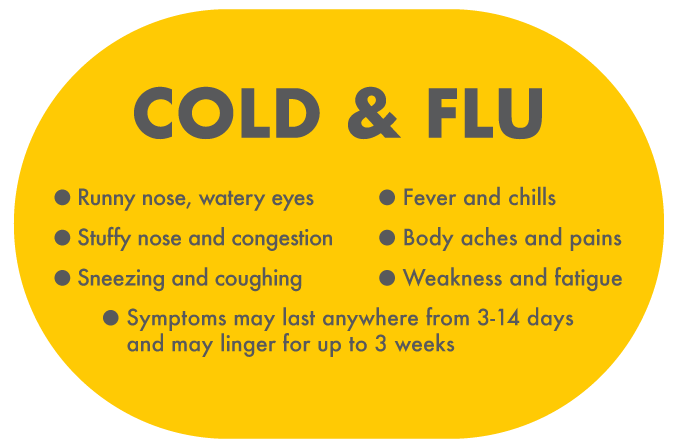 What are the symptoms of cold & flu? What causes cold & flu? The symptoms of cold & flu usually start when you first get a runny nose, followed by watery eyes. Next a stuffy nose and then congestion sets in. And if you’re really unlucky, the sneezing and coughing may start. These symptoms normally last 3-10 days. They may come in stages, peaking when you feel them all at once. In some cases, you may develop fever and chills. Your body aches, making you feel weak and tired. These symptoms may require medical attention and normally last 7-14 days, or up to 21 days if you’re hit badly. A cough. Dry and tickly or chesty and full of mucus. A blocked nose. This may be caused by the membrane lining in your nose swelling up. Headaches. They are usually caused by an increase in temperature, dehydration and even a blocked nose. A fever. Your body fights the infection and your temperature rises above 37.2ºC. General body aches and pains. Rest up, drink plenty of water and take care of your symptoms with CODRAL®. Cold & Flu is an infection which can be caused by a virus. Strangely it has nothing to do with cold climates! It comes from other people’s germs. It’s just when it’s cold, people tend to be closer together, and more likely to share germs. Cold & Flu is highly contagious. When an infected person coughs, sneezes or speaks, the virus will travel on droplets through the air where it can be easily picked up by the next person. How to relieve cold & flu? You will need a lot of rest, plenty of fluids and time to allow your cold & flu to run its course. But there are always some extra things that you can do to help minimise your discomfort. Keep the air moist with a humidifier to ease the throat and nose discomfort. A soothing, warm liquid such as chicken soup can calm a sore, scratchy throat. Wash your hands often to avoid spreading infection. If washing is not possible, keeping a small bottle of hand sanitizer in your handbag can be useful. Take care of your symptoms with over-the-counter medicines such as CODRAL® - see below for appropriate CODRAL® treatments. CODRAL® has a wide range of products that use different active ingredients. Find out more about the ingredients used in our products. Summer or winter, cold & flu can take its hold on you. Although there are a few things you can do to help keep cold & flu at bay. Discuss with your healthcare professional whether a flu vaccination is right for you. Wash your hands and home surfaces regularly. Eat foods with lots of vitamins and minerals to boost your immune system. Make exercise part of your life to keep your immune system fighting fit. Cover your mouth when you cough or sneeze. The germs travel through the air. Wash your hands regularly to kill any bacteria that may cause infection. Or reach for that bottle of hand sanitizer in your handbag. Throw away used tissues. Keeping bacteria in your pocket is a no-no.